dodge — the company that thought there was a middle ground to be exploited between a 717-horsepower car and an 840-hp car and came up with the 797-hp challenger srt hellcat redeye — has outdone itself again with the debut of the hellephant, a supercharged 426-cubic-inch hemi crate motor, at the 2018 specialty equipment market association show in las vegas. this under-hood behemoth makes a dodge-claimed 1,000 hp and 950 pounds-feet of torque. the used engine itself looks really cool and is on display at sema as a standalone installation ... but it doesn't look as cool as the 1968 dodge "super charger" concept built specifically to house the hellephant. the super charger combines the classic looks of the 1968 charger with modern touches — and a little of a 1971 plymouth duster thrown in for good measure. starting with a '68 charger, all the door handles and key cylinders were shaved off, and the side mirrors were replaced with those from the aforementioned duster. the wheelbase was lengthened 2 inches for the wide-body fender flares and to shorten the front overhang of the car. the hood combines original steel and modern fiberglass and is meant to look like the scooped hood on the challenger srt demon. the front and rear bumpers are custom fiberglass and sit flush with the body. in front, modern challenger hellcat headlights provide better lighting and more air to the hellephant in a new take on the charger's classic popup headlights. the tail of the super charger is multinational, with a spoiler that looks like one from a current challenger r/t and exhaust tips from the alfa romeo stelvio. the led taillights wrap around the exhaust tips for a more menacing look. inside is a six-speed manual transmission identical to those available in a current challenger hellcat; a dodge viper steering wheel and front seats join custom mopar gauges and pedals. in a nod to the power of the hellephant, the seats include four-point racing harnesses, and instead of rear seats, there's an integrated custom roll cage. dodge's hellephant logo is found inside and out, and it joins the hellcat and demon badges as yet another awesome angry creature adorning a dodge vehicle. how does one make a stylized elephant look angry, you might ask? one solution: give it knives for eyes. there's no word on pricing for the hellephant crate motor kit and associated parts also necessary for installation. 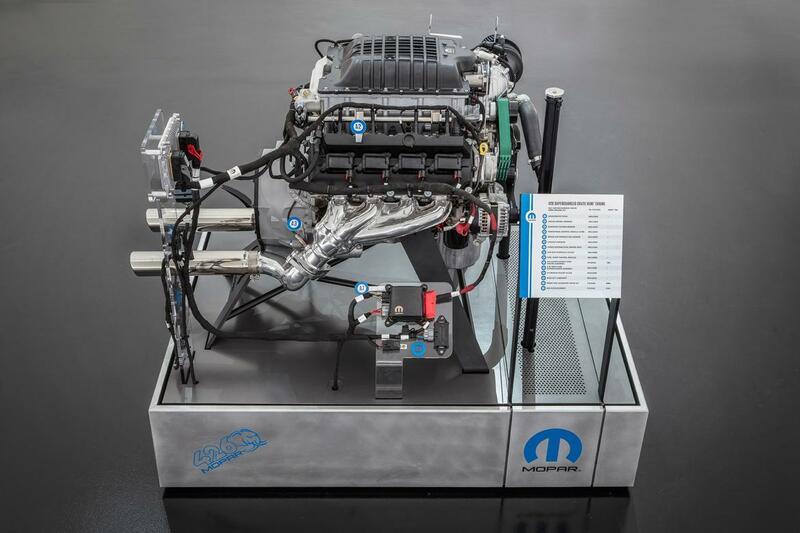 last year's hellcrate motor, the supercharged 6.2-liter v-8 found in hellcat models, retailed for more than $20,000 including all the parts for installation. expect the hellephant to cost a lot more. as for the super charger, well ... if you have to ask, you can't afford it.